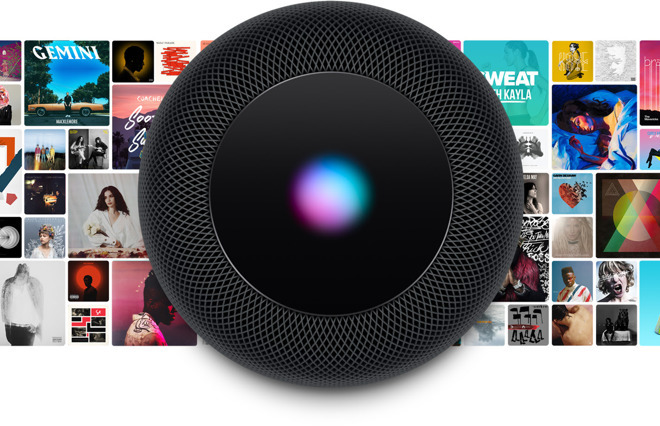 In newly-published specifications, Apple has confirmed that streaming on the Siri-equipped HomePod —shipping Feb. 9 —will focus mainly on its own services. The $349 device will foremost support Apple Music, Beats 1, and podcasts, purchases, and Match libraries from iTunes. The only way of streaming third-party media will be via AirPlay, even though the speaker incorporates Bluetooth 5.0.
iTunes Match compatibility was discovered earlier this week. Since revealing the HomePod at last June's WWDC, Apple has made no bones about the product being Apple-centric, but until now it hadn't disclosed the full scope of functionality. A lack of third-party music could be an obstacle for Apple in the smartspeaker market. Rival products from Amazon and Google not only support several services out of the box, but let users pick which one they want as default. The company has geared much of its marketing around sound quality. Promotions have touted technologies like beamforming, and the use of dedicated amps for each of seven tweeters. In that sense the HomePod's main competition may be the $199 Sonos One and the $399 Google Home Max.